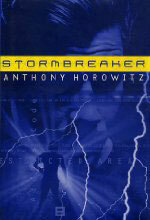 adapted as "Alex Rider: Operation Stormbreaker"
Synopsis: They told him his uncle died in a car accident. Fourteen-year-old Alex knows that's a lie, and the bullet holes in his uncle's windshield confirm his suspicions. But nothing prepares him for the news that the uncle he always thought he knew was really a spy for MI6—Britain's top secret intelligence agency. Recruited to find his uncle's killers and complete his final mission, Alex suddenly finds himself caught in a deadly game of cat and mouse.